Everything I want in a book: action, romance, mystery and insight. Sage weaves all the pieces of this intricate story together, resulting in a fascinatingly creepy ending. I’m skilfully moved through a plot of complex intertwined relationships where I quickly forget the stark proposition that is so beautifully voiced at the very infancy of the book. I get to dive into the minds of each character and see the world vividly through their seemingly unique eyes. However this is not a book to be predicted or second-guessed in any way. As I journey deeper I’m presented with a profound exploration of the nature of ‘self’ – each page facilitates a deeper plunge into our elemental reality in search of identity – to see if anything we can call ‘I’ is present in the mysterious physical soup of life. Where is this nebulous ‘self’ that lurks in the shadows of flesh and bone? I’m eventually swept away on a ride so utterly unexpected that to turn a page is to voyage into a delicious mystery. A sinister modern thriller with a gripping plot and well-drawn, believable characters. The author’s keen sense of observation, coupled with an ability to make his characters and their surroundings come to life, transports his reader into a world as vivid as the one outside of the book. I was impressed and absorbed. Daniel Sage has laid claim to the area of science that lies in the borders between fiction and fact and gives a vivid and compelling insight into just where the 21st Century is leading. The writing was excellent and the plot a real page turner. A very good read, and ride. Kind of two step pace but totally worth it. The first few chapters give a slightly slowish build up but I liked getting to know Jeff and the descriptions are great. Plus there’s enough intrigue -who’s doing what to who and all. And then it takes off properly. I loved the way the plots crossed over and came together. Very satisfying tie up. What I enjoyed most was the author’s ability to fully take me to the places he describes: knowing London reasonably well, I found myself seeing, smelling and walking London streets. I could feel myself ‘transported’ to California (where I’d never been), swimming and enjoying the sunshine. I’d definitely recommend it. 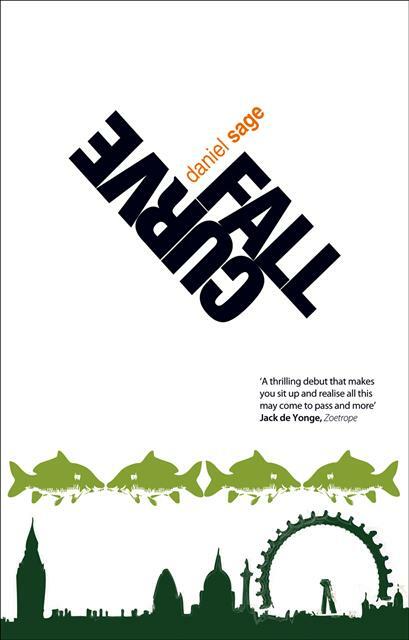 I gave Fall Curve five stars because it didn’t pander to any genre, because the story’s original and engaging and becuase it’s full of great writing… Jeff, the protagonist, is likeable, deep, funny, a modern hero who doesn’t have to be tough or tortured. and the story just gets better as it goes along. Fall Curve is in many ways a daunting book. We can’t find redemption from our loneliness within our families, amongst our friends or lovers. All there is left for us is our acceptance and the need to be strong and to fend for ourselves. Paradise is truly lost. But whatever redemption can be offered is made through the writing. It seems as though the daunting and perpetual failure of the world is made good by Sage’s beautiful and passionate portrayal of it. Our ever-present loneliness ends and becomes forgotten through his masterly use of language and through descriptions that are tainted by an absolute love and wonder for this life. I totally enjoyed reading this book. It is very intelligent, multi-dimensional and invites us to debate… A tale that, with great ambition and skill, seems to encompass all that there is to human existence – youth, old age, death, love, friendship, family, children, our own determination and strength and the absence of it all.